Oliver Twist would feel for the 350 million tonnes of toxic chemicals still sitting inside the defunct Union Carbide factory in Bhopal. In 1984, an accident at the chemical company's plant spewed deadly methyl isocyanate gas into the air, immediately killing 3,500 people. Residents subsequently suffered from deadly cancers and generations of children continue to be born with horrendous birth defects. 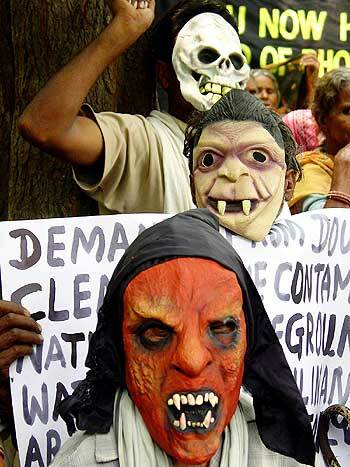 Union Carbide subsequently fled India but it left behind a toxic sludge for someone else to clean up. However, much like Dickens' hapless orphan, the toxic chemicals parked outside the plant cannot seem to find a new home, ensuring that the remnants of a terrible tragedy continue to play out today in a surreal saga even though two decades have gone by since the accident. It is not as if there haven't been attempts to get rid of the stuff. In 2009, when Jairam Ramesh took over as the environment minister, the issue of the toxic waste lying at the plant site bubbled to the surface. There was an attempt to burn the waste near Pithampur in Indore but that initiative failed. Then, the erstwhile Environment Minister apparently wrote to Defence Minister A K Antony to allow the waste to be disposed off at the Defence Research and Development Organisation site near Nagpur where it could be incinerated. 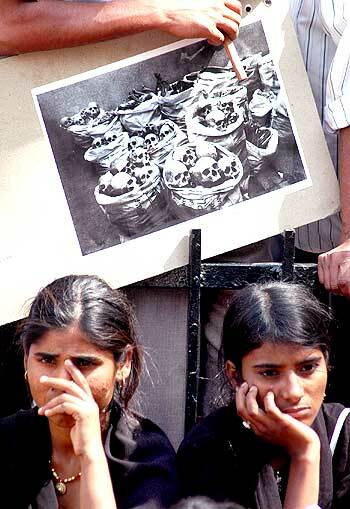 Image: Accident at Union Carbide plant killed 3,500 in 1984. Just when the last rites were about to be performed on Union Carbide's mess, the Maharashtra State Pollution Board has said that it is yet to give permission to DRDO to ferry the waste from Bhopal. "Since, it involves transfer of hazardous waste from one state to another, permission of both the MP pollution control Board and the Maharashtra pollution Board is required. 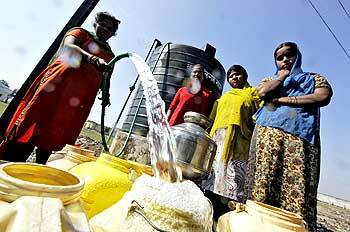 We have not granted any permission so far," a senior official from the Maharashtra State Pollution Control Board said. Earlier, the Gujarat government also refused to allow the waste to be incinerated in their state. As of last week however, the Madhya Pradesh High Court stepped in and ordered the state government to take temporary steps within 10 days to transport the sludge to the DRDO facility in Nagpur. The bench, after listening to both sides, directed the state government to make temporary arrangements for the transport of one tonne of toxic waste per day to Nagpur within 10 days and also asked the DRDO to start its disposal process simultaneously. However, nothing has transpired since then. You would have thought that the parent company of Union Carbide, Dow Chemicals, which bought it in 2001, would be interested in fixing an image-battering disaster that its subsidiary was responsible for several years ago. Image: Court has ordered urgent disposal of waste. After all, its website is filled with many lofty proclamations such as: "There's only one planet earth, with limited resource. So everything we do, and how we do it, has an impact." Yet, Dow treats any issue related to Union Carbide like it would a cancer. When asked as to whether it is willing to help the government in the clean-up, Scot Wheeler, a representative of the company responded with alacrity in an e-mail statement that said that the responsibility for the clean-up of the Bhopal site lies with the Madhya Pradesh State government, not with Dow or UCC. Wheeler directed Business Standard to a statement from Dow, which says that in 1998, several years before Union Carbide became a subsidiary of Dow, the Madhya Pradesh State Government, which owned and had been leasing the property to UCIL - the subsidiary that ran Union Carbide's plant - took over the facilities. It then assumed all accountability for the site, including the completion of any additional remediation. Dow's website claims to be deeply interested in ideas that "connect chemistry and innovation with the principles of sustainability to help address many of the world's most challenging problems such as the need for clean water "
Image: Dow says Madhya Pradesh government is responsible for the clean-up. Judging by this impressive manifesto, one would think that it would see this as a golden opportunity to put those ideas into practice, and furthermore, garner goodwill by helping to clean up the considerable mess that its errant child was responsible for. 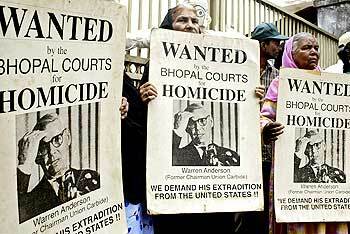 Instead, Dow has preferred to wield legalese to ensure that none of the ooze from Bhopal stains itself. "While UCC's stock is owned by Dow, UCC remains a separate company as a Dow subsidiary. Under well-established principles of corporate law, both in India and the United States, Dow did not assume UCC's liabilities as part of the 2001 acquisition transaction," says the Dow statement. Union Carbide, after the tragedy, was allowed by the Supreme Court of India to expeditiously flog its interest in UCIL and flee the country. Reports from a wide swath of organisations, including the Bhopal Medical Appeal, state that the $490 million settlement paid out by UCC to the disaster victims, does not in fact cover liabilities arising from environmental devastation and from subsequent and continued contamination of the area and its groundwater. In fact, in the past two decades - and this is the most distressing part of the whole affair - several studies have concluded that the material containing toxins and heavy metals from the plant leeched into the ground, considerably contaminating groundwater and therefore everything from vegetables to breastmilk. Image: The toxics have contaminated everything, from vegetables to milk. Based on the directives of the Task Force constituted by High Court of Madhya Pradesh, the Bhopal Gas Tragedy Relief and Rehabilitation Department sponsored a joint study in March 2009 to National Environmental Engineering Research Institute, Nagpur, and National Geophysical Research Institute, Hyderabad, for assessment of contamination and the outlining of suitable strategies for the remediation of contaminated areas in and around the UCIL site. The report concluded that the contamination of soil and groundwater in and around UCIL premises is solely due to Union Carbide's dumping of various wastes - but during 1969 to 1984 - which means that the MIC gas tragedy has no relevance to it. The report states that about 11,00,000 MT of soil was contaminated within and outside UCIL premises. Indian non-profit organisation the Centre for Science and Environment also carried out a study in 2009. They tested water and soil samples from in and around the UCIL factory for the presence of chlorinated benzene compounds, organochlorine and carbamate pesticides and heavy metals - all toxic chemicals that were either used as ingredients or were waste products generated by the plant. The results prove that the plant site is highly contaminated and has infected the groundwater of the surrounding areas. 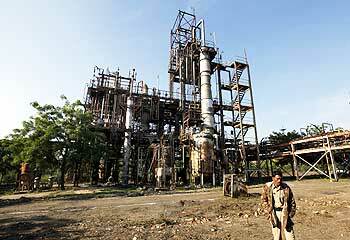 Meanwhile, the Union Cabinet at its meeting held on June 24th, 2010 approved the setting up of an Oversight Committee in the Ministry of Environment and Forests to coordinate and monitor all activities at the Bhopal Gas Tragedy site relating to waste disposal, decontamination and remediation. Image: Plant site is highly contaminated. While the primary responsibility for waste disposal, decontamination and remediation will be that of the state government, the Oversight Committee will ensure that the requisite technical, financial, logistics and other support is available to the state government and its authorities at all times, while remedial action is taken. The Oversight Committee during its meeting on May 25, 2011, discussed the recommendations of the Peer Review committee in Bhopal. 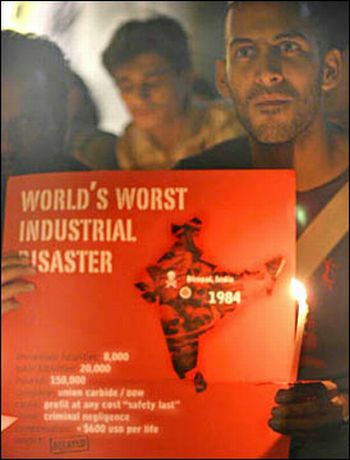 However, the leaders of five organisations made up of the survivors of the 1984 disaster in Bhopal charged the recommendations to be unscientific, unilaterally decided and designed to help Dow chemical get away from liabilities by paying a pittance for environmental remediation. For those fighting a lonely battle for justice over the last 26 years, the decades-long 'passing-the-toxic-waste-parcel' doesn't augur much light at the end of the tunnel. Bal Krishna Namdeo of Pension Bhogy Sangharsh Morcha, an NGO working in Bhopal feels that Dow Chemicals, the new owner of Union Carbide, should be made to pay for the clean-up. "Tax payers money should not be used for cleaning the mess created by the corporate." Dow apparently thinks that the toxic sludge affair is not 'one of the world's most challenging problems' or that Indian children drinking contaminated water doesn't neatly fit into its "Global Water Initiative." Or it is simply not interested, a sentiment that Oliver Twist can relate to. Image: Justice is not in sight for victims.